Is knitting the new Yoga? 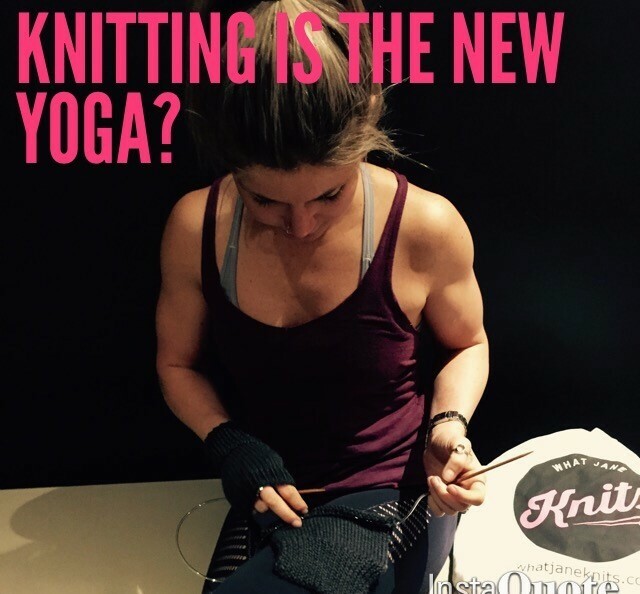 We've all seen the Instagram post and wondered - IS knitting really the same as yoga? As a knitter and regular yoga practitioner I can see how the two practices have been compared. Yoga is promoted as a way to distract our minds from a hectic and stressful lifestyle. The focus on breath and mindfulness is intrinsic to Yoga. Knitting is supposed to be a repetitive and relaxing process. However in my experience the two activities (knitting & yoga) are only very slightly similar. In fact I could say that swimming puts me in a more meditative mindset than knitting. The disconnect from thinking about anything but breathe and movement puts you in the present. It stops your mind working on plans for the future or stressing about the past. Mindfulness is a great benefit of Yoga but I certainly don't find it passive. Most of the the Yoga classes I do result in me dripping with sweat- they require actively focusing on muscles and sequences of movement as well as breathing. There is definitely no sweating when it comes to knitting! Unless of course it's a particularly hot day and your air con is broken. Knitting can create a relaxed and meditative mindset but of course it is dependent on your skill level and what you are actually doing. Many patterns are quite complex and while you do require focus, it is often frustrating to read and re-read a pattern and keep track of your stitches. I guess if you are frustrated you are pretty much in the present! The meditative part comes from repetition, such as long spells of knitting stocking stitch or garter stitch. They can really become hypnotic and I have found myself literally knitting with my eyes closed as the knit purl rows send me in a trance! Even with a simple stitch and repetitive movement - many knitters are often multi-tasking - watching TV or listening to a podcast or just chatting. This does not give you a stillness of mind - rather a distracted mind. I strongly believe in the therapeutic benefits of knitting. Creativity and mental health are always positively linked. However for me, the benefits I receive from knitting and yoga are very different. In fact part of the health benefits of yoga is that it actually gets you moving - knitting is so very stagnant and your wrists, hands, shoulders and back can often become stiff from knitting too long. So yoga is almost an antidote to the passivity of yoga - allowing us to stretch and move with mindfulness. What is true, is that Knitting and Yoga are both ancient skills that have recently received a renewed popularity each with their own health benefits. So jump on board, get connected, get creative and maybe knit yourself a yoga mat! Don't miss a trick. Sign up here. Knitting kits for beginners. Welcome to the world of knitting where you can learn to knit with a What Jane Knits kit. The knitting projects featured are designed to be simple and easy to finish... we like people to feel confident in their skills and proud of their achievements. These simple and stylish knitting projects contain the best quality Australian yarns, patterns, knitting needles and sewing needle. Never knitted before? Don't know how to finish off your project? No problems... video tutorials are available online. Video tutorials take you through knitting techniques to help you cast on, knit, cast off and other stitches you will need to know. What Jane Knits will be the start of your love of knitting.